SCVHistory.com EH5101 | Melody Ranch | Patricia Ann Hickson Visits Placeritos Ranch ~1951. Patricia Ann Hickson, niece of movie ranch owner Ernie Hickson, poses for a photo during a visit to her uncle's Placeritos Ranch. (This is) a copy of my personal favorite photograph of my mother, Patricia Ann Hickson, taken at the ranch. She so loved it there. I believe this photo was taken around her 18th birthday; she was born 5-20-1933. Her brother Ernest Hickson and sister Suzanne Hickson spent much time there as kids. 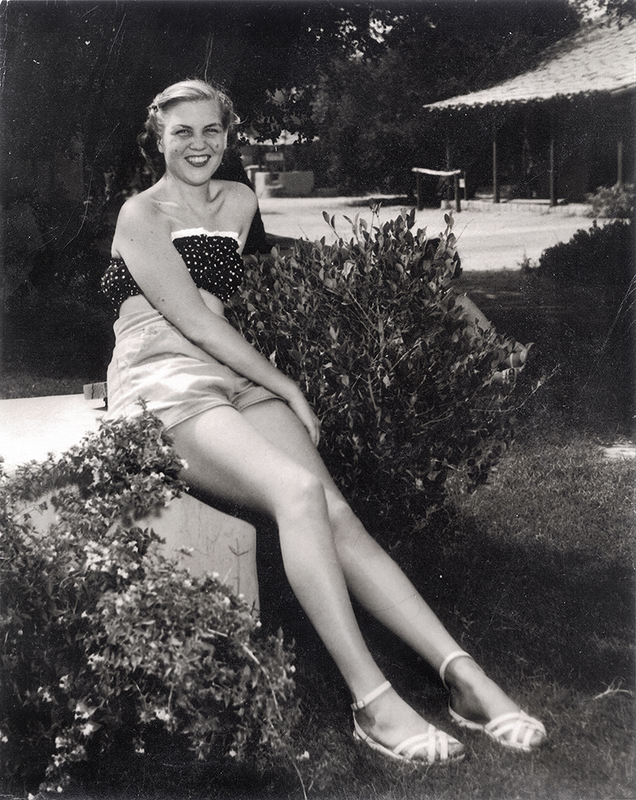 Patricia turned 18 in 1951, a year before uncle Ernie's death and the subsequent sale of the ranch to Gene Autry. It's possible the photograph could be slightly older; a note on the back asks, "1949?" A set decorator with a traveling theater troupe, Ernie Hickson came out West from Ohio in 1922 and applied his talents to the screen, earning his first move credit in 1924. By 1930 he was building Western sets in Placerita Canyon for producer Trem Carr. The first sets were erected just east of today's state Route 14, where the Walt Disney Co.'s Golden Oak Ranch is located today. In 1936, Carr lost his lease, so Hickson moved the buildings to the site of today's Melody Ranch. In the 1930s and '40s the name was Monogram Ranch (Carr co-founded Monogram Studios). Hickson and Carr eventually parted company; Hickson bought out Carr's interest in the business and renamed it Placeritos Ranch on June 21, 1941. Hickson leased his 110-acre ranch to production companies that churned out dozens of "B" (low-budget) Westerns each year, and he opened it to the public on Sundays when production wasn't underway. In his final years, 1949 to 1951, Hickson hosted a giant Fourth of July celebration for the Newhall community, transforming his movie ranch into the Old West town of "Slippery Gulch" for the occasion. Click here for the complete Monogram/Placeritos/Melody Ranch story. EH5101: 9600 dpi jpeg from 8.5x11-inch copy print courtesy of Maryanne Byrne.